2 What is third-degree price discrimination? Quick DefinitionThird-degree price discrimination is when a firm charges different market segments different prices for the same good. What is third-degree price discrimination? Third-degree price discrimination is a pricing strategy which involves a firm charging different market segments different prices for the same good. For example, Museum XYZ charges adults £6, but students £4. Third-degree price discrimination (TDPD) is possible when the firm knows that there are segments within the market (e.g. Museum XYZ knows that some people are willing to pay £6 but others are willing to pay only £4), and is able to distinguish between them (e.g. Museum XYZ knows that it is students who are only willing to pay £4, and adults who are willing to pay £6). This knowledge results in the firm offering several price points for the good/service, with the explicit objective of certain consumers purchasing at each price. The cost of supplying the good/service to each segment is the same. Hence, there is a single marginal cost curve on the aggregate graph below. The firm either receives no change in welfare, or is better off by using TDPD instead of uniform pricing. This is because if charging the same price to each group (uniform pricing) if it offers greater welfare than charging different prices, the firm will do that, despite having the knowledge of separate groups. The consumers who have more price inelastic demand are worse off, as they are charged a higher price (see middle graph). In contrast, consumers with more elastic demand are better off, as they are charged a lower price (see left graph). The right-hand graph depicts the whole market that Museum XYZ faces for tickets to the museum. This is made up from the student market and the adult market added together. Price discrimination – The practice of a firm charging different consumers different prices for the same good or service. Price elastic demand – A small change in price prompts a great change in quantity demanded. 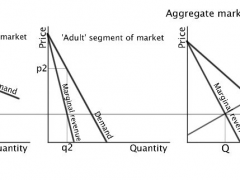 Price elasticity of demand – The responsiveness of demand to changes in price. Price inelastic demand – A large change in price prompts a small change in quantity demanded. Uniform pricing – A pricing strategy in which a firm offers a single price for each good/service it provides.